The Canadian War Museum in Ottawa has acquired a significant piece of Canadian military heritage, ensuring it will stay in the country for the benefit of future generations. The Victoria Cross awarded to Lieutenant-Colonel David Vivian Currie for exceptional leadership and valour in the Second World War was unveiled Tuesday afternoon at an event that included Currie’s grandchildren and Minister of Veterans Affairs Seamus O’Regan. “This is an acquisition of outstanding national significance,” said Mark O’Neill, President and CEO of the Canadian War Museum and the Canadian Museum of History. The Victoria Cross remains the Commonwealth’s highest honour for military valour. Just 16 were awarded to Canadians who served during the Second World War, and Currie’s is the only one associated with the fighting at Normandy. The Currie medal set made headlines last fall when it was purchased at auction by a buyer in the United Kingdom, who intended to take it out of Canada. First, the buyer had to apply for an export permit through the federal government’s Movable Cultural Property Program. When that happens, the Department of Canadian Heritage sets a time period during which a Canadian buyer or institution can come forward and purchase the property back. Through a combination of private donations, government grants and its own donor-supported National Collection Fund, the Canadian War Museum was able to purchase the Currie medal set. 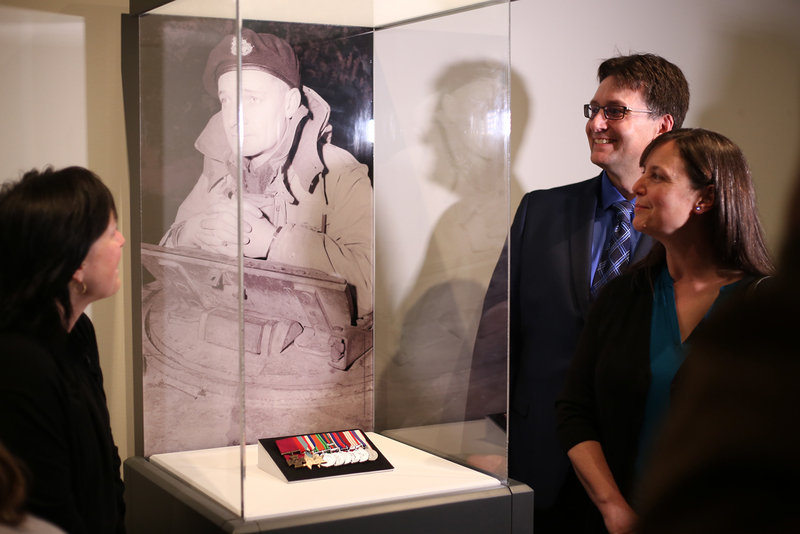 It’s one of three such Victoria Cross medal sets acquired by the museum in the past six months in an ongoing effort to preserve the stories of individual Canadian soldiers. The others, acquired in November and December of last year, were awarded to Colonel Harcus Strachan of the Fort Garry Horse and Corporal Colin Fraser Barron of the Canadian Expeditionary Force for their actions at Masnières and Passchendaele respectively during the First World War. While conventional military history often focuses on battle tactics and outcomes, the medals remind us of the people behind those battles, said Veterans Affairs Minister O’Regan. In August 1944, the then-32-year-old Currie was a Major in the South Alberta Regiment of the Royal Canadian Armoured Corps. During the Battle of Falaise, Normandy, he commanded a small battlegroup that had been ordered to cut off one of the Germans’ main escape routes. He sustained his men through three days of intense fighting and thwarted repeated breakout attempts by the enemy, thus helping to secure victory in the decisive battle of the war. After his military career, he went on to serve for 19 years as Sergeant-at-Arms in the Canadian House of Commons. He died in 1986 at the age of 73. Speaking at Tuesday’s event, his granddaughter, Sandy Currie, praised the successful effort to keep her grandfather’s medals in Canada.